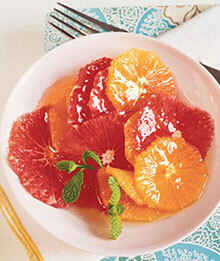 Cut the ends off the grapefruit and oranges and stand upright. Cut away the remaining skin and membrane, exposing the fruit. Cut between the membranes to release the sections. Combine the fruit sections in a bowl and gently toss with stevia and coconut. Arrange on individual plates and sprinkle with macadamia nuts.